Chances are that your trip to Argentina, will involve visiting the popular tourist attractions. Possibly the beautiful UNESCO Heritage gorge, Quebrada de Humahuaca in Jujuy province. Or perhaps, the Cementerio de Recoleta where Eva Peron is buried in Buenos Aires. 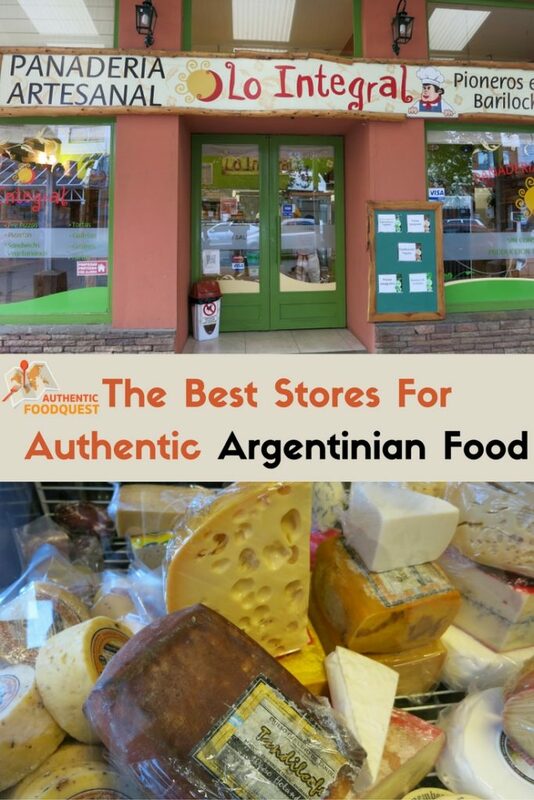 But have you ever thought about visiting the local Argentinian food stores? Often times, food stores are an overlooked attraction. Think of the local food stores or local supermarkets as “food museums”. You would be surprised at the hidden gems you might discover. When traveling, make a point to visit local food stores with the same curiosity as you do a museum. 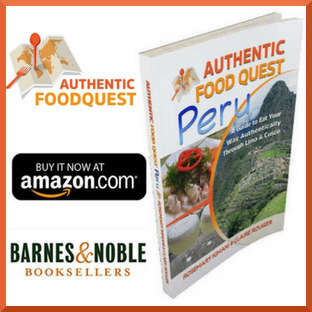 Instead of seeing art or sculptures, you will be seeing the authentic foods of the region. 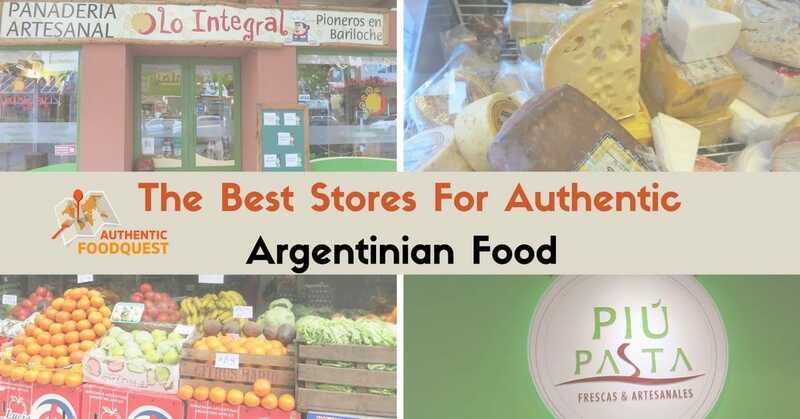 To feed your curiosity and make you salivate, here are 8 of the best Argentinian food stores we discovered on our quest for authentic food in Argentina. On your way to hike the spectacular Glacier Perito Moreno in Patagonia, make sure to stop at Distrisur for your grocery needs. It is a family and locally owned business. They carry fruits, vegetables, dairy, meat, Argentine local wines, fresh artisanal pasta, and other scrumptious produce. Distrisur is definitively the best Argentinian food store in El Calafate where tons of tourists flock each year to visit the glacier. By shopping there, you will not only treat yourself to the best food in town, but you are also supporting local businesses! The Italian influence in Argentina runs deep and is manifested by the high number of fresh pasta food stores. Piú Pasta in Bariloche makes some of the best pasta we’ve had in Argentina. The pasta is artisanal and made fresh every day. In addition, they also make whole wheat pasta. Choose from pasta in all sizes, colors and shapes. There are more options than you can think of! The Piú Pasta specialty is the ravioli, with very creative fillings. Are you tempted by the ravioles de cacao con queso azul (ravioli made of chocolate with blue cheese fillings)? After all, in Bariloche, chocolate is a local specialty. Or would you rather be tempted by ravioli filled with the local specialty: Patagonia lamb? Taste Piú Pasta just once and watch the “pastaphile” emerge in you. Delicious and so easy to prepare. Just boil some water and deep the pasta into the boiling water. Wait a few minutes and it is ready! 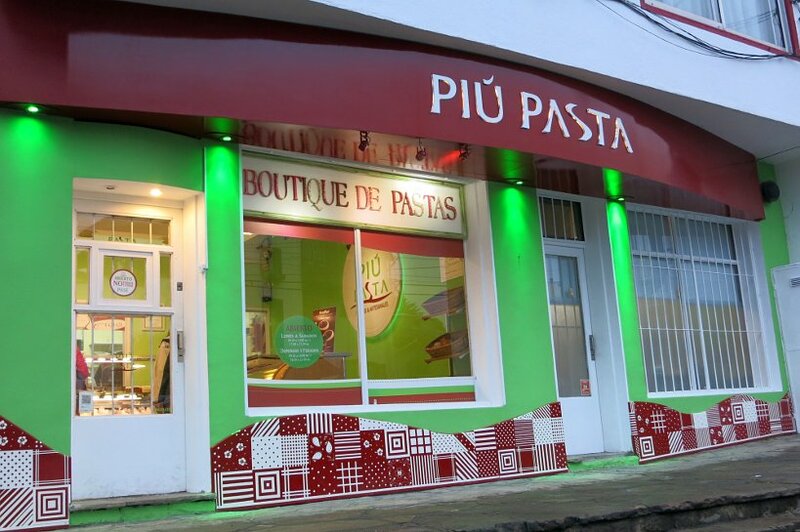 For an even better experience, pair the pasta with one of the many succulent sauces from Piú Pasta. This is the perfect meal after a day of hiking in Bariloche. Hours: Monday-Saturday from 9am to 2pm and 5pm to 9:30pm; Sunday 9:30am to 2pm. 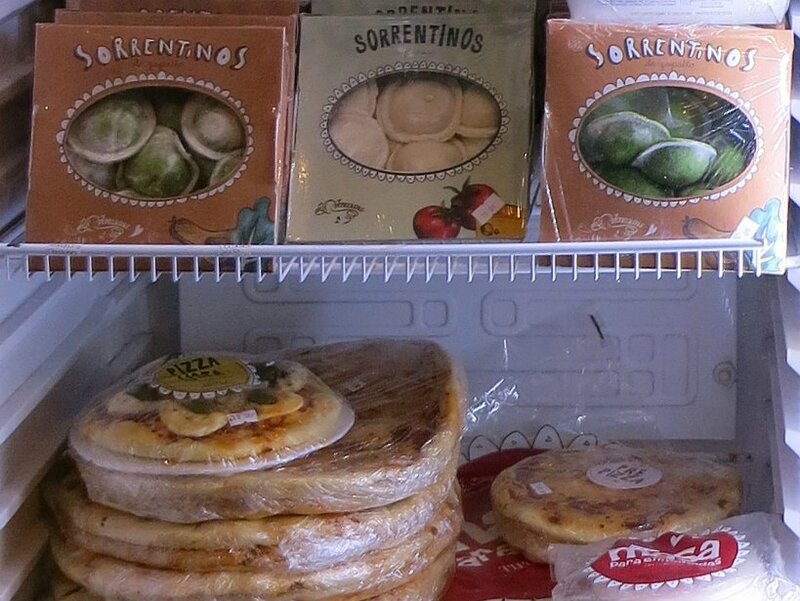 Sorrentinos are a local pasta specialty from Mendoza. The best place to get them is La Veneciana. This artisanal store offers delicious fresh pasta, bread, and pastries. The highlight is the Sorrentinos pasta. You can choose pasta options from cheese to tomatoes and basil and much more! They also sell, Ñoquis (Gnocchi), another popular Argentinean pasta specialty. At the food store, you will also find delicious sauces to make a full meal with the pasta of your choice. They have several locations listed with hours on their website. Your best bet is the main location in downtown Mendoza. Hours: Daily from 8am to 10pm. 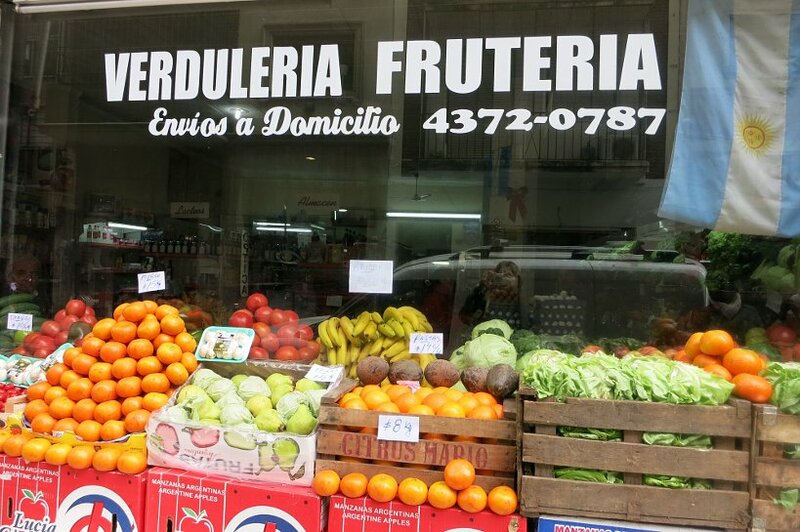 Verdulerías y Fruterías are Argentinian corner grocery stores that sell fresh fruits and vegetables. You will find them literally at every corner across the country. Some are large stores, while the vast majority are smaller mom and pop shops. One great benefit of verdulerías y fruterias is they typically sell seasonal vegetables and fruits. By buying what is in season, you will enjoy the most delicious produce with the fullest flavors. In Ushuaia (nicknamed “End of The World”), on our quest for the local specialties, we struggled to find fresh produce. It was a great surprise to find Mendosur. Here you will not only get fresh fruits and vegetables, but also friendly customer service. Try some of the local beers and wines as well as organic products at a very reasonable price. This Argentinian grocery store has a very local vibe. A nice change from the vibrant and touristy downtown area. Ahhhh! Delicious Argentinian bakeries! We could dedicate one article entirely to all the excellent bakeries in Argentina. Choosing a bakery with the most unique and authentic products to offer was tough. 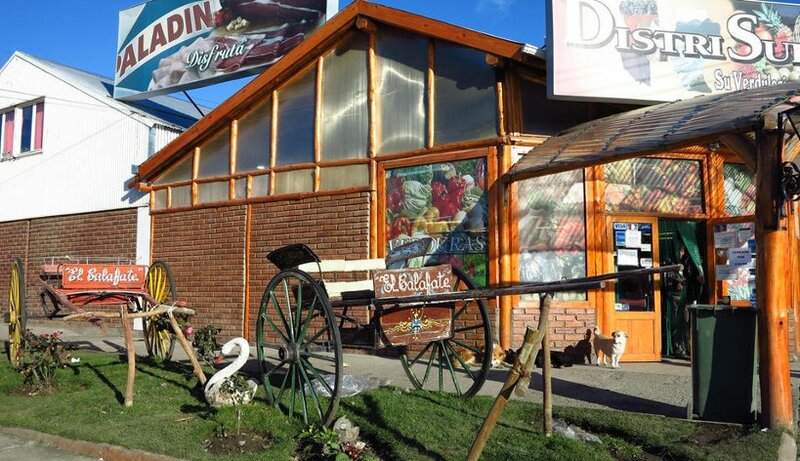 After much debate, we nominate Lo Integral Bakery in Bariloche. This is a rare bakery where everything is made with whole wheat flour. All the bread and delicious Argentine sweets like alfajores and medialunas are made daily with whole wheat and artisanal products. 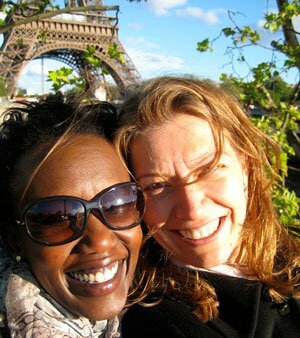 You will also find vegetarian sandwiches, fresh pasta from Piú Pasta, and vegan products. The cookies are amazing and a rare find in Argentina. 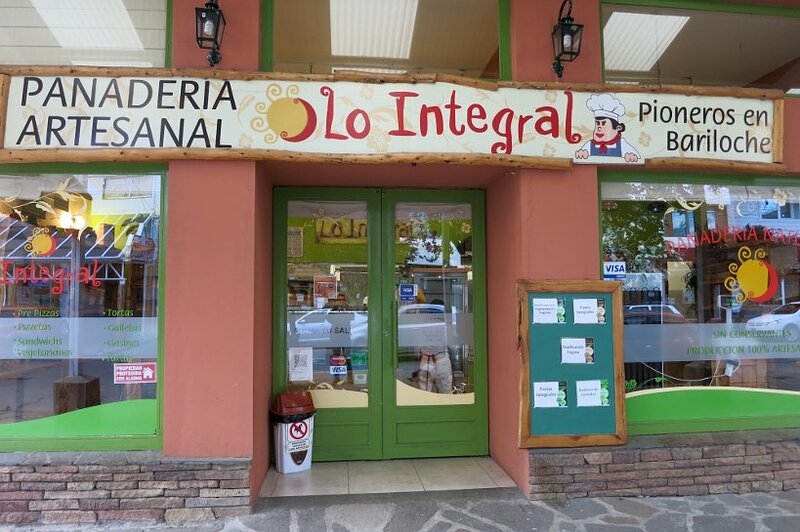 On your next trip to Bariloche and the Lake Region, don’t forget to stop by and stock up at Lo Integral. In Bariloche, one would think it would be easy to find cured meat and cheese stores. After all cured meats like boar and deer are the local specialties we discovered. However, beyond the touristy Family Weiss store, finding a good deli store is not easy. Fortunately, there is La Pata Negra, a regional cheese and cured meat store that provides great quality products. And it shows. Unless you get there earlier enough, be prepared to wait in line at this cozy boutique. That will give you time admire the collection of Argentinian regional and local beers. Enough to tempt you to take one with you. 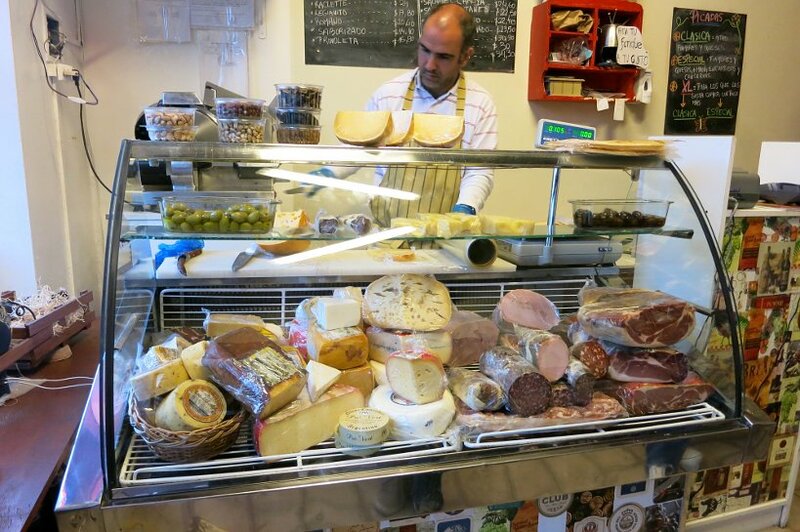 With a nice display of cheeses and cured meat, you get to pick from high-quality products at very reasonable price. Don’t be intimidated, Bathis, the owner, will have you try samples and find you something for your tastes. One of the specialties of this Argentinian food store is the famous picada. In Argentina, a picada is a platter of cured meat and cheese to eat as an appetizer. Ideal to share with newly made friends on your travels. We definitively recommend visiting this store to prepare your picnic, if you’re planning on hiking in the region! Address: Belgrano 126, San Carlos de Bariloche, Argentina. Hours: Monday-Saturday, 8:30am to 1:30pm and 5:30pm to 9:30pm. In the Quebrada de Humahuaca, you will not want to miss the popular village of Purmamarca. Here, you can revel at the unique and beautiful Cerro de Los Siete Colores (Hill of Seven Colors). Tucked in the middle of the arts and crafts of the village, you will find this hidden gem, the dietetica and artisanal food store of Purmamarca. Dietéticas in Argentina are like health food stores. You can find specialty products, including vegetarian and gluten-free items. The main staples are usually raw sugar, artisanal honey, spices and all sorts of different grains and dried fruits. This dietetica is a breath of fresh air in Purmamarca where the vendors are eager to attract the tourists. Located in a quieter part of the artisanal market, the lady who received us didn’t harass or push us to buy any products. 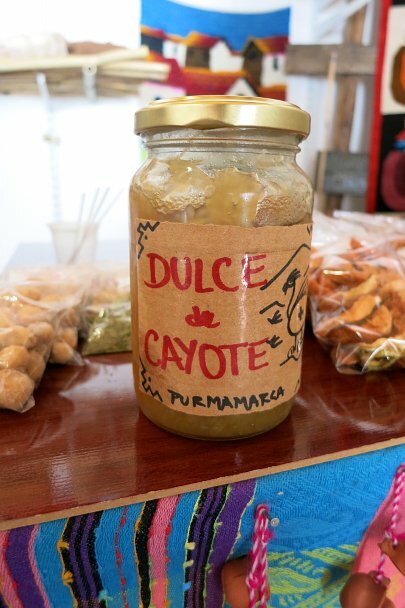 In her boutique, you will find the famous dulce de cayote, a sweet marmalade we discovered in Salta Province. She had us sample some of her homemade dulce de cayote and explained to us how it was made. We could not resist and ended up buying the dulce de cayote candies. From spices to sweets and herbs, this is definitively a refreshing store where you will find unique food souvenirs. It is difficult, if not impossible to talk about Argentinian food stores without mentioning meat. Where do people buy the world most famous meat? At Carnicerías! Carnicerías can be best described as local butchers. At these stores, you will find different cuts of beef similar to the ones you can enjoy at a parrilla (local steakhouse). The beef is generally the main meat on display, though you will also find sausages, poultry, and cured meats. Carnicería Nucho is no exception. This large carniceria in the Mercado del Progreso, is always busy with locals buying their daily meat. Carnicería Nucho is also known to have the best molleja (sweetbread) in Buenos Aires, which is what makes them “El Rey,” the King! Definitively plan on visiting Carnicería Nucho at Mercado del Progreso. It is more than a butcher, it is an experience. Don’t miss out on this local market attraction on your visit to Buenos Aires! Hours: Monday-Saturday from 8am to 1pm and 5pm to 8:30pm. Find them on Facebook: Facebook.com/NuchoCarnicerias. 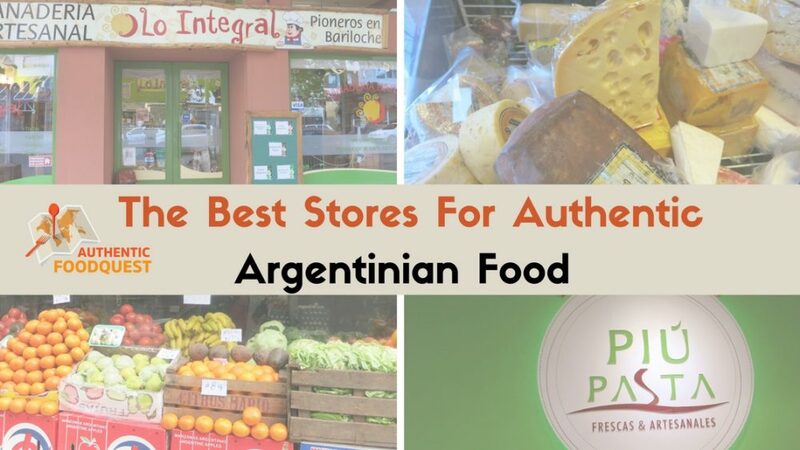 After reading this article, we bet food stores will become a hot item on your bucket list of sites to see in Argentina. 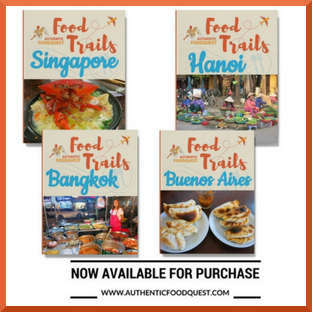 These stores visits are a great way to feed your stomach with authentic and local foods. But beyond your stomach, these “food museums” will feed your curiosity and craving for understanding the local and cultural landscape. Enjoyed reading this article? 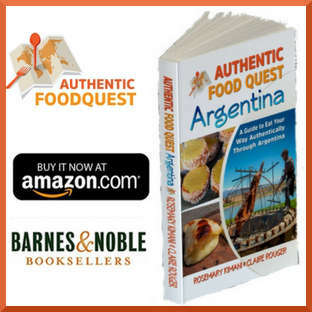 As you prepare for your trip to Argentina, you will find many more food store references, markets, and restaurants in our Amazon Bestseller book: Authentic Food Quest Argentina: A Guide to Eat Your Way Authentically Through Argentina Grab your copy TODAY on Amazon! I wish I could access all of these! I love finding stores that sell authentic ingredients. I’ve personally just visited a Greek store today and bought supplies. Great article showing such a great range of places to buy these wonderful ingredients and foods. Thank you Kerri. There is so much “richness” at local grocery stores. Truly fascinating and what we call “food museums.” That’s wonderful that you shop at Greek stores. I’m sure it’s so great to see the differences in the similar products you buy 🙂 Thanks for sharing your experience. What a great resource. We self cater overseas and always shop at local stores and markets ? These stores look great and wow you got to see a glacier, I have seen one in the Himalayas they are so beautiful . Great write up love the variety and the pics! Thank you Prateek for your comments. Glad you enjoyed the write-up and the pictures. Perito Moreno is simply incredible. Can only imagine just how beautiful the Himalayas are.That’s great. Cheers! Thank you Eloise. Appreciate it!!! So glad you enjoyed reading the post. We were amazed at the diversity of great stores in Argentina. Yes….the cheese..yum!!! 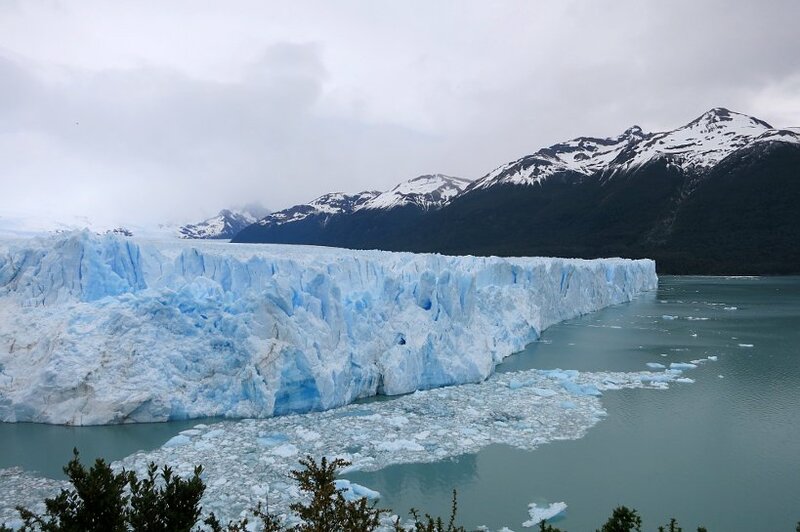 So glad you love the photo of Perito Moreno. Seeing it and walking on the glacier was a unique experience. Yes, the meat is outstanding….but there is much more than the beef 🙂 Cheers! That scenery looks so incredible. But I can see from your post that it’s not only the scenery that can be interesting about a place, but the food and the food stores. This is very useful info! Visiting local foodstores are the best way to experience authentic food. Oh my gosh I need to try the ravioli with the chocolate and blue cheese fillings! 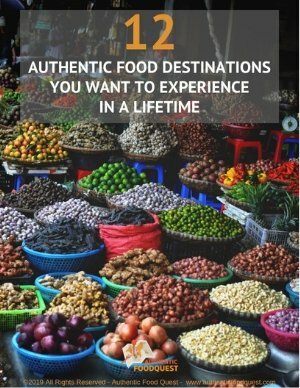 Yes, Marteen indeed food stores are great for experiencing the authentic foods. You know, we didn’t have the chance try the chocolate and blue cheese ravioli.. so many great choices to choose from…and so little time to eat!! 🙂 Cheers! I love visiting grocery stores around the world. It’s always cool to see how similar and how different they can be from home. I also love seeing crazy foods that I would never imagine seeing in a grocery store back home! 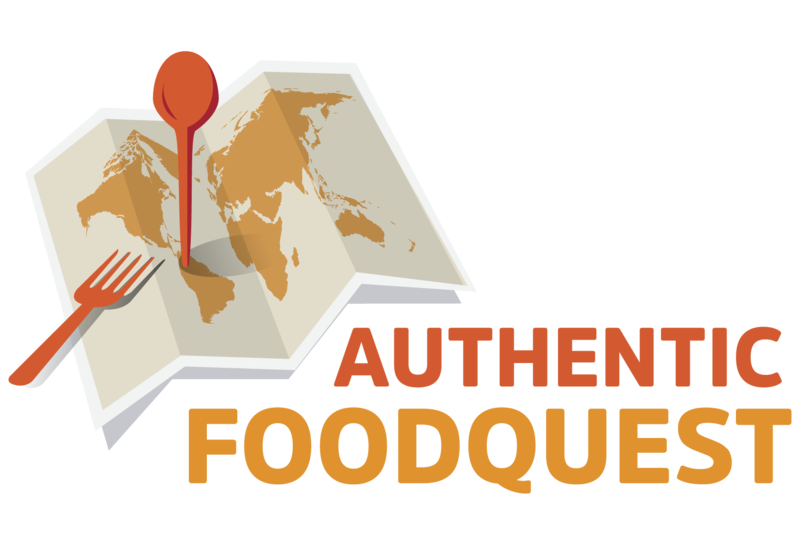 I like that you’re highlighting not just authentic restaurants but where you can authentic ingredients to create meals for yourself. Would love to have the chance to dig into some Argentinian food. Thanks Megan for your comments and support. We really want to inspire people to create their own food adventures – at restaurants or at “home”. The idea is to travel deeper through food!! Appreciate your comments. So glad you enjoyed “discovering” these 8 places in Argentina. And,glad that you check out local stores on your travels too. Truly, Lo Integral Bakery was a delightful find. Not only was the bread delicious, the staff was amazing as well. Hope you make it to Argentina soon. Cheers! Thank you Nancy and so happy to hear that you enjoyed the post. Glad you also enjoy visiting food stores as well. Hope you get to Argentina soon. Cheers! So glad that the post made you “crave” for food 🙂 I do hope you get to Argentina soon. The food is incredible and it goes way beyond beef and malbec wines. Keep this future reference indeed. Thanks Aileen. Yum!! It must be fantastic getting and eating freshly cut meat. There’s nothing that tops knowing where your food comes from. Good to know where to try the best Mollejas! I haven’t sampled any Argentinean food before but I would love to try some. Checking out stores that sell authentic but foreign staples is one of my favourite things to do when I’m in the city! Glad you love visiting the local food stores as well. It is really a unique cultural experience. What’s the most interesting thing you’ve discovered? Argentinian food stores are so much fun!! Thanks for your comments Carly. Finally, a travel post after my own heart! My favourite thing to do in a foreign country is to visit their grocery stores, and I’m absolutely digging the recommendations! Thanks for this! You are so welcome, Tammi! Glad to find another lover of local food stores. Thanks for your comments! Lot’s of great food selection! Thanks for the tip! Now I know where can I find the freshest food there in Argentina. So glad you enjoyed reading the post. Do indeed keep the tips in mind when you get to Argentina. Cheers!